Thanks to our sturdy fleet of expedition landing crafts and virtually untippable kayaks, you can be off the ship and out exploring within a moment's notice. Launch your kayak from a picturesque beach, hike with our naturalists into the rain forest or walk easily along a sandy dune. 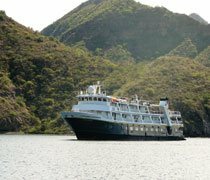 During your time with us, our expedition staff likes nothing better than to surprise and delight you by directing the ship toward breaching whales, bow-riding dolphins or into an alluring cove. Our seasoned crew consists of expert expedition landing craft drivers and considerate service providers. Their energy, enthusiasm and field expertise are sure to enhance your experience. This is what expedition travel is all about: not just seeing wildness, but being out there, in it. $100 per Couple Shipboard Credit. Price is per person, double occupancy.